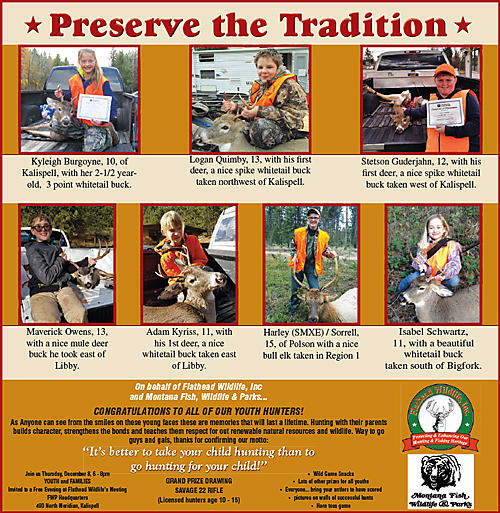 Hunting — Flathead Wildlife, INC.
Each week during the hunting season Flathead Wildlife, Inc. runs a “Preserve The Tradition” newspaper ad highlighting successful young hunter, or hunters, with game at FWP check stations as a way to highlight and protect our outdoor heritage. Flathead Wildlife, Inc. also works with Flathead Electric Roundup For Safety and FWP to give every successful graduate of the Hunter Education Program a hunter orange safety vest. FWI comments on proposed changes in hunting regulations. FWI comments on projects to protect and enhance wildlife habitat. Deer and Elk Permits: Must be postmarked on or before March 15. Moose, Sheep, Goat Licenses: Must be postmarked on or before May 1. Antelope, Deer B, and Elk B Licenses: Must be postmarked on or before June 1. After the drawings are completed Click here to check results.